It’s always something special for a photographer when a significant museum or collector acquires some of his or her work. For Wendy Paton, a pleasant surprise such as this just occurred. Paton’s latest body of work, Photograms: Literary, and selections from the series, Visages de Nuit, have been purchased by the Bibliothèque Nationale de France (National Library of France) for its permanent collection. Wendy Paton is an award winning American photographer, best known for her dramatic black and white candid, nocturnal portraits. Still working with film and printing in a traditional darkroom setting, she now splits her creative life between her studio in Lambertville, New Jersey and Paris. Paton’s keen interest in photography began in 1981 while in the throes of a groundbreaking career training and driving Standardbred racehorses. She went on to study at the International Center of Photography in New York City, learning the intricacies of night photography from Michael Kenna and darkroom printing from her mentor and collaborator, master printer, Chuck Kelton. Paton had her first solo exhibition in New York City at Sous Les Etoiles Gallery in 2010 and has had numerous exhibitions in galleries and museums throughout the U.S. and Europe. 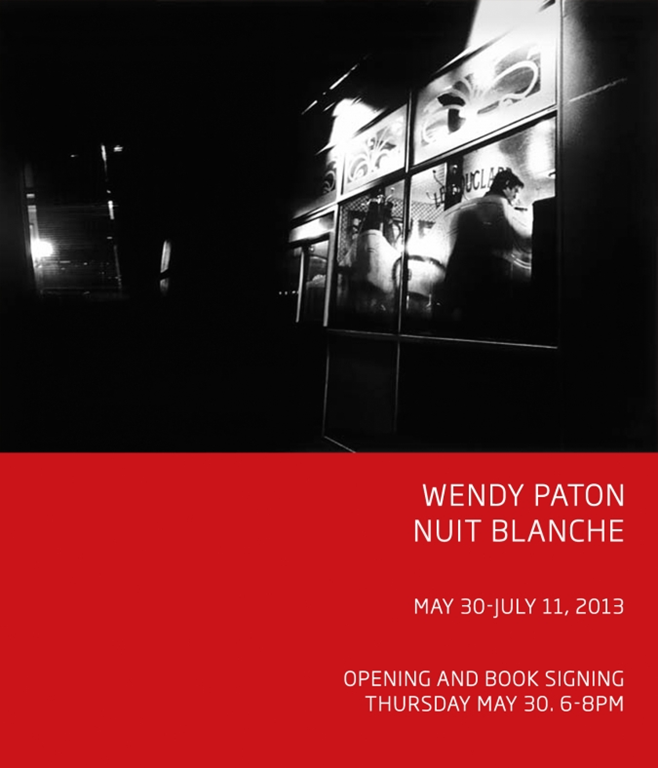 Wendy Paton: Visages de Nuit, in Moscow at the Lumiere Brothers Center for Photography. In 2014 Paton’s first U. S. solo museum exhibition, WENDY PATON | NUIT BLANCHE, opened at The James A. Michener Art Museum in Doylestown, Pennsylvania. Her images have been published in international publications as well as exhibition and museum catalogs, and appeared on CNN and Russia Today television. Her photographs are included in the permanent collections of Musee de la Photographie, James A. Michener Art Museum, Lumiere Brothers Center of Photography in Moscow, International Center of Photography, Bibliotheque Nationale de France, Personal Collection of His Serene Highness Prince Albert II of Monaco as well as other notable private collections. In a related note, Photograms: Literary, the monograph will be published in 2017. Our friend Wendy Paton has a MAJOR exhibition at the Michener Museum in Doylestown, Pa. With over 60 works on display this is an opportunity to view the work of a major contemporary artist. An award winning fine art photographer, Wendy Paton was in the throes of a successful, ground breaking career training and driving Standardbred race horses in New York, when in 1981, her interest in photography emerged.She studied at the International Center of Photography in New York, learned the intricacies of night photography from Michael Kenna, and darkroom printing techniques from her mentor and collaborator, master printer Chuck Kelton. Consisting of two bodies of work,NUIT BLANCHE comprises a premiere selection of Paton’s Visages de Nuit, complemented by a collection of her latest series,Reclaiming Dignity, in an installation of seventy of the artist’s gelatin silver prints. VISAGES DE NUIT is a collection of 51 black and white candid night portraits, shot over a six-year period from 2006-2012 in various international cities. Paton created this series of nocturnal images, exploring the mystery of the night and bringing the viewer into her subject’s nighttime world. Their dark, gritty characteristics purposely convey Paton’s interpretation of the surreal quality of life at night, and what is hiding behind what we normally view as reality. One of the contemporary masters of Black and White is Wendy Paton. Her new exhibit at Sous Les Etoiles Gallery is a must see. With her street photography approach to low light image capture, she captures the moment with great facility. Add to that technique her use of unique contrast enhancement in the darkroom process … you have truly sophisticated photography. Two internationally known artists are in exhibition at Red Filter Gallery. 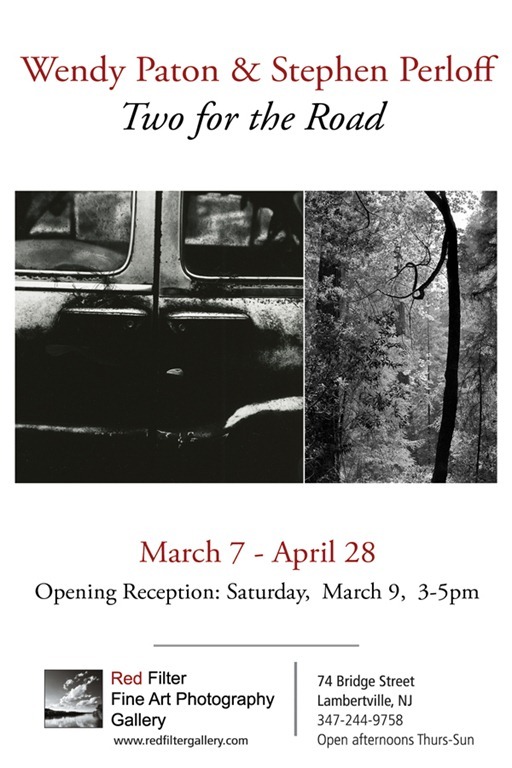 "Two for the Road," featuring the work of Wendy Paton and Stephen Perloff, is an intriguing collaboration of two artists interacting through visual dialogue in an exhibition they created out of their personal work. The exhibition will begin at the Gallery March 7. Wendy Paton is an American photographer, widely exhibited and best known for her dramatic, black and white night portraits. Paton’s work has been widely exhibited in gallery and museum venues internationally and is included in notable private and public collections. Her work has been published in the U.S., Europe and Russia, in CNN WORLD, Prime Time Russia Today, Schwarzweiss Magazine, Moscow News, Le Journal de la Photographie, and The Photo Review, among others. In September 2012 a retrospective of her series of candid night portraits,“Visages de Nuit” opened at the museum at The Lumiere Center for Photography in Moscow. Stephen Perloff, founder and editor of The Photo Review, and editor of The Photograph Collector, leading sources of international information, critique and the fine art photography market, is a recognized photographer as well. His work has been included in collections at the James A. Michener Art Museum, The Print Center of Philadelphia, The Philadelphia Museum of Art, the Photo West Gallery of Philadelphia, and the Germantown Academy. Exhibition participation in 2012 included, "Unseen Color, Part I," at the Light Room Gallery in Philadelphia, "Making Magic: Beauty in Word and Image," at the James A. Michener Art Museum, and InVision Photography Festival in Bethlehem, PA.